Thai Green Chicken Curry is another popular dish from Thailand. Green curry is one of the several type of curry used in Thailand cooking. Green curry paste is available in most supermarkets or any Asian store. Green chicken curry usually cooked with small round young green eggplants but as an alternative the regular Asian eggplant can be used. Button mushrooms and bamboo shoots may also be added for texture. Another must ingredient is the leaves of kaffir lime, it is also available in Asian stores dried or frozen. If you have tried and learned to love Thailand Tom Yum dishes or Pad Thai noodle dishes, I am very sure that you will definitely love this dish. 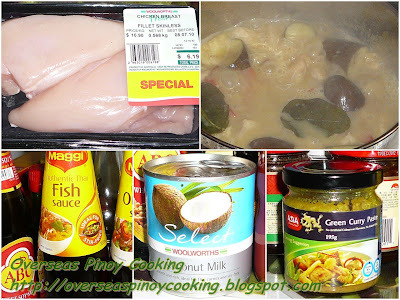 Here is how I cooked my version of Thai Green Chicken Curry. In a sauce pan sauté garlic and onion add in chicken and stir cook for 2 to 3 minutes. Add in the kaffir lime leaves, fish sauce and Thai green curry paste, stir cook for 3 to 5 minutes. Add in 1 cup of water and 1 cup of the coconut milk, stirring occasionally bring to a boil and simmer for 10 to 15 minutes. Add in the remaining coconut milk, eggplants and red chili stirring occasionally simmer for 3 to 5 minutes or until vegetables are half cooked. Thicken sauce with cornstarch diluted in 1/4 cup of water and cook for another 1 to 2 minutes. Serve with a lot of rice.